Move the pot away all the way to the left. Press the silver button 4 times. 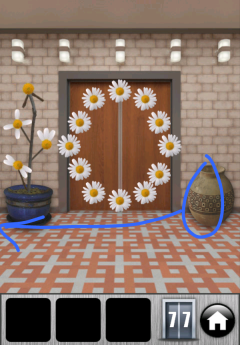 Now create the patterns of the flowers on the left from bottom to top, using the flowers on the door. First, remove all the flowers except flowers between the top and left flowers, as well as the flowers between the right and bottom flowers, then press the button. Second, remove all the current flowers except the highest one, and add the top flower and the one to the right, then press the button. 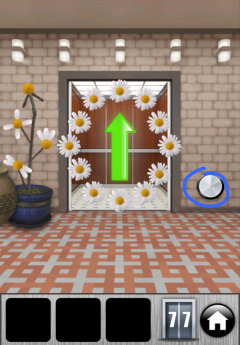 Third, remove all the flowers except the top one, and add the left, bottom, and right flowers, then press the button. Finally, remove all the flowers then press the button.